Fifa has said Palestine can no longer host their World Cup qualifiers against Saudi Arabia and Malaysia, which must now be played on "neutral ground". Saudi Arabia pulled out of Thursday's match against Palestine in Ramallah, having previously cited "exceptional circumstances" around the fixture. Many Arab nations refuse to play in the West Bank, arguing it legitimises Israel's occupation of the territory. Malaysia's away match against Palestine on 12 November will also move venue. In the past two months there has been a surge in violence between Palestinians and Israelis. Fifa said the decision followed a meeting held in Palestine on Tuesday between Fifa's security officer and local authorities, after which the Palestinian government confirmed that it "could no longer guarantee the safety and security around the matches in question". Malaysia had written to Fifa to request their match was moved from Hebron, but later agreed to play the match at the original venue with the option of withdrawing from the fixture up to 24 hours before kick-off if unrest escalated. Earlier this year, Saudi Arabia said it would refuse to travel to the West Bank for the fixture. But the Palestinian Football Association refused their demands to move the match claiming it would set a "dangerous precedent". 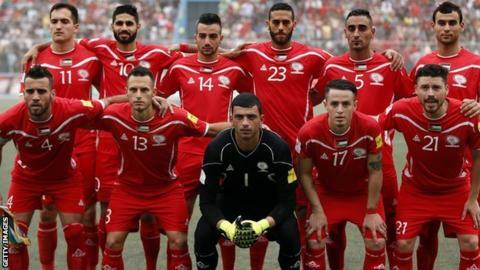 Both games will now be played elsewhere in Asia, at venues yet to be decided, with Palestine's match against Saudi Arabia taking place on 9 November - four days later than originally scheduled. Malaysia's match remains on 12 November. Palestine has been a member of Fifa since 1998 and played their first World Cup qualifier in the Palestinian Territories in 2011. They qualified the Asian Cup for the first time in 2014.